We know that living in Tennessee has taken a toll on my health in the area of lung function. I have dropped 24% in the 22 months living here. I have asthma along with CF so that is a double whammy. I did skin allergy testing about a year ago and it showed that I wasn’t allergic to anything. I was hoping that it would show something so I could have some answers as to why I was having such a hard time. I was bummed. I wanted answers. I had an appointment with the allergist today. When I came home from Florida on Monday night, I started coughing a lot pretty much as soon as I got outside of the airport and in the car to head home. My husband said, “sounds like your lungs are not happy to be home. It has to be the allergens.” That settled it. I was making an appointment with the allergist to get this figured out. Which brings me to today. They wrote orders for lab work for an IgE RAST test which will test my blood for allergen reactions along with an anti-Pneumococcal antibody titre and a Tdap antibody titre. The titre tests are to check to see if I am deficient in the Pneumococcal, Tetanus-Diphtheria-Pertussis antibodies. Both of those have to do with the immune system and if I am deficient it would affect how my body fights infection. 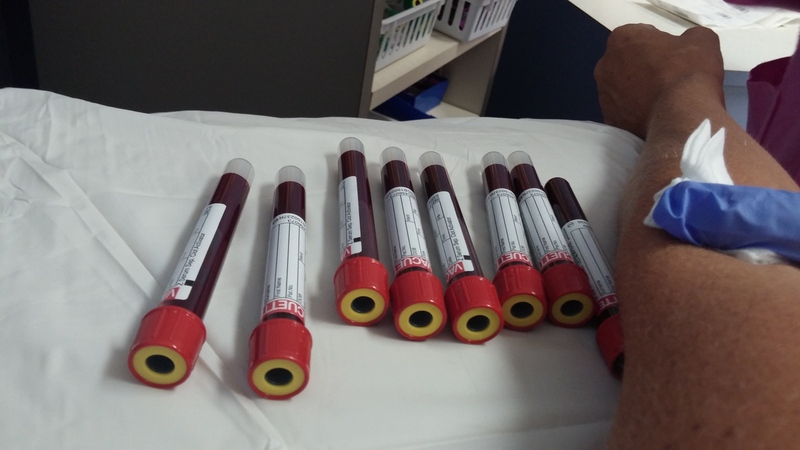 I went to the lab after my appointment and they drew 8 tubes of blood!!! (see picture below) Hopefully we will have answers after all of that. I’m not willing to accept that we don’t know what is causing the decline in my lung function, shortness of breath and increased asthma symptoms. If you are a CF happens reader then you know I saw the ENT doc last month and he said my sinuses were full of allergic inflammation. We are going to try a nose spray to help with that. The nose spray is Atrovent (Ipratropium bromide) which is actually part of the combo medicine, DuoNeb, I inhale. Interesting! She also gave me an inhaler called QVAR, which is basically the inhaled version of prednisone without the side effects. It hopefully will help with the tightness in my chest, wheezing and all the other asthma symptoms. If/when I see improvement I am to stop using it. It is for short term use only. Hopefully we will have answers this time. I see her again in 2 months. That’s some blood and it better give me answers!